​Sometimes, after I finish a painting, I write down my feelings about the experience in little notebooks, which I keep in my car. I find it interesting to read them as I work on the paintings back in the studio. ​The tide is going out. The boats start to settle on the mud. The fiddler crabs are suddenly everywhere. Rushing water and the sounds of life fill my ears. I paint the random sequence of events unfolding before me. ​Today I asked old man Kenniston if I could paint his barns and pastures. To my relief, he said yes. The barns I chose to paint were 200 years old and relics of a distant past. They reminded me of the ruins of ancient Rome with an American twist. I was amazed how much I enjoyed myself painting here, my palette knife loaded with dabs of paint caressing the rough surface of the canvas. I used color and tone to describe the intimacy of the scene. It was a great painting day. ​Today dawned clear and produced the most beautiful cerulean blue sky. The wind came up on the change of the tide, rustling the water to a deep viridian hue. I am on the side of the road using the trunk of my Toyota Echo as a table. I’m looking across Pleasant Bay at the yacht club and moored boats in the distance. Even though I started the painting as a horizontal, I change my mind in mid-sentence making the painting a vertical. This necessitates moving all the paint that is now in the wrong place to where it needs to go. 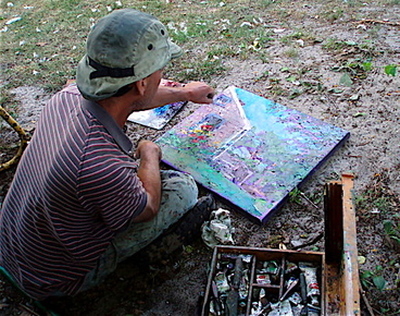 The scraping of the palette knife on the canvas focuses my mind on the act of artistic creation. I leave the painting open, adjusting the horizon line as I go along. The painting has an air of spontaneity about it. Happy colors on a happy day. 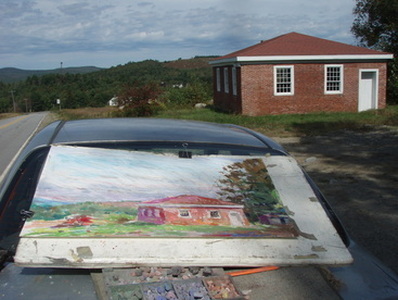 ​Today I painted on the grounds of the original Hawthorne School of Art in Provincetown. 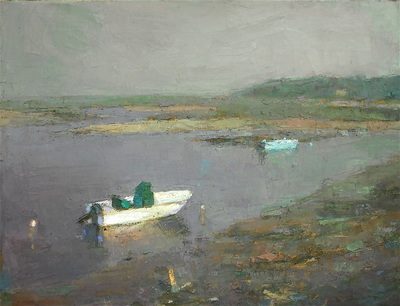 Charles Hawthorne, the founder of one of the first artist colonies in North America, established the school in 1899. 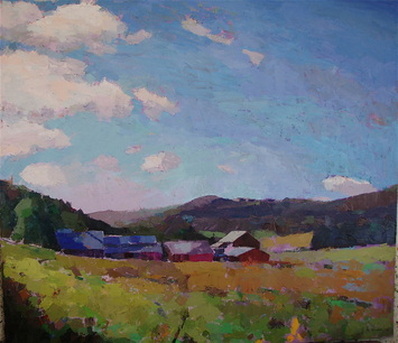 Since then, influential artists such as Hans Hoffman, Norman Rockwell, Franz Kline and Lee Krasner have painted and taught on these hallowed grounds. I felt a sense of history just roaming around the place. The original barn, the beautiful flowerbeds and distant views of the great dunes and Cape Cod Bay competed for my artistic attention. As overwhelmed as I was, I settled on an intimate scene of flowers set against a classic Cape Cod cottage. This cottage, a relic of centuries past, was once used to house Hawthorne’s students while they studied with the master. In order to get the right vantage point, I had to dislodge a couple of ducks from their perch. When starting a painting, I generally try to be at least 30 feet away from the subject (an old Corot mantra). Unfortunately, for this painting, I had to be much closer thus giving the painting a homier, more intimate feeling. In order to achieve the results I was after, I had to paint in a more impressionist manner than I normally do. Bolder strokes of grasses and sky are contrasted by small staccato strokes identifying flowers and leaves. The painting became a unique image codifying the quintessential spirit of the place. ​Yesterday, Al took me to an undisclosed location to paint. He felt I would really enjoy “his secret place” and he would share it with me on condition that I never divulge its location. We started off on the main road turning onto progressively smaller roads until we were driving on two sand ruts deep in the seashore. Apparently, he was taking me to a place that was once a thriving community but was now just a few winding paths through the forest. After many twists and turns, we came upon a dunescape covered in heather. A meandering stream was barely visible in the foreground but in the distance one could see a few cottages and the bay and even Provincetown in the distance. He left me there to paint having shared with me his secret place.